A Vietnamese delegation led by Deputy Minister of Public Security Lt. General Bui Van Thanh called on Minister of State for Home Affairs Hansraj Gangaram Ahir here today.During the occasion, Shri Hansraj Gangaram Ahir said that India and Vietnam share a strong bilateral security relation. He said that bilateral instruments on security had been signed between the two countries, which strengthen the common objective of fighting terrorism and international crime. India and Vietnam are also working on building a Cyber Forensic Lab in Vietnam, he added. The Minister said that Central Bureau of Investigation had imparted training to Vietnam law enforcement personnel in investigation in the field of money laundering and banking frauds.Lt. General Bui Van Thanh said that he appreciates the support provided by India to Vietnam from time to time and he sees today’s meeting as an opportunity to further improve the ties between India and Vietnam. 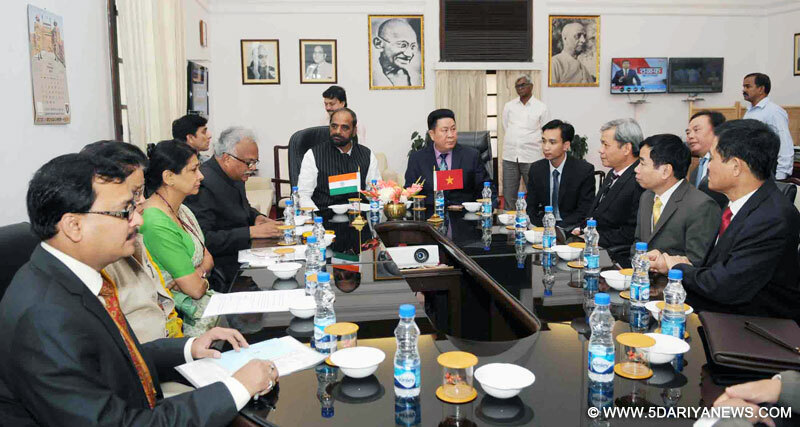 He highlighted that India and Vietnam have completed ten years of Strategic Partnership.The Deputy Minister said that he expects India to extend security Line of Credit to Vietnam, on the lines of Defence Line of Credit provided to Vietnam in September, this year. He also said that there should be a security dialogue at the Deputy Ministerial level to increase the information sharing between the two countries. The Deputy Minister expressed concern over the fire fighting equipments in Vietnam and asked India to share the latest equipments and techniques available in fire fighting.DG, Bureau of Police Research & Development, Dr. M.C.Borwankar and other senior officers of the MHA were present on the occasion.